Dr. Bernard Harris and students at the 2017 ExxonMobil Bernard Harris Summer Science Camp. The Center for Pre-College Programs (CPCP) at New Jersey Institute of Technology (NJIT) welcomes Bernard Harris, M.D., as an honorary member of its Advisory Board. CPCP, established in 1979, increases access to scientific and technological fields among traditionally underrepresented populations and improves the teaching of science and mathematics in secondary and elementary schools. The first African-American to walk in space, as payload commander on Space Shuttle Discovery STS-63 in 1995, Dr. Harris has long supported math and science education for American youth. He is founder of The Harris Foundation, which co-funds the annual ExxonMobil Bernard Harris Summer Science Camp. 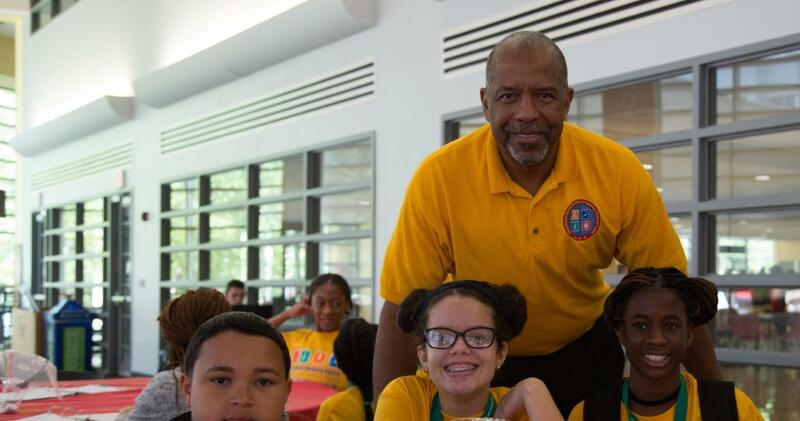 The two-week residential camp, coordinated at NJIT by CPCP, provides underrepresented and underserved middle school students with STEM projects, experiments and field experiences. It also introduces them to college and campus life, and helps them develop problem-solving, critical-thinking, communication and research skills. In addition to his decade-long tenure at NASA, Dr. Harris has more than 20 years of business experience, serving in various leadership and board-of-director roles at many prominent companies, organizations and institutions. He currently is chief executive officer (CEO) and managing partner of Vesalius Ventures, Inc., a venture capital firm that invests in early-to-midstage health care technologies and companies, and recently was named the new CEO, effective mid-2018, of the National Math and Science Initiative, which works to “significantly improve student opportunities and achievement by advancing STEM teaching and learning.” He also has an extensive medical background, earning his doctorate of medicine from Texas Tech University School of Medicine and completing his postgraduate training at Mayo Clinic and NASA Ames Research Center. Today he is an assistant professor in the Department of Family and Community Medicine at Baylor College of Medicine in Houston. Dr. Harris is the recipient of numerous honors as well, including the 2000 Horatio Alger Award, NASA’s Space Flight Medal and Award of Merit, and honorary doctorates from NJIT, Stony Brook University, Morehouse School of Medicine, Washington & Jefferson College, Worcester Polytechnic Institute, University of Hartford and Indiana Institute of Technology.